Last week we left for a trip to California, it was a little bit for work and a little bit of a holiday – although the holiday part was on the edge as work always seems to get in the way. 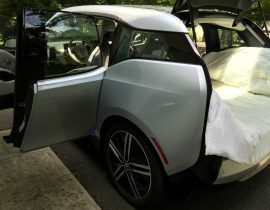 As we don’t have a Tesla Model S we were left with having to fly from New Jersey to California – taking the BMW i3 just didn’t seem practical but the Drive-Now car sharing program from BMWi looked like it just might be. The BMW program is primarily designed as an intercity one-way short term need-a-car solution but, they encourage you to keep the car for as long as you like and, whilst $60/day isn’t the cheapest option, it does come with a premium grade car, fully loaded and able to seat four. We wondered, as a holiday rental for seven days, could we enjoy a week without sacrificing the enjoyment of driving electric? Not wanting to sacrifice a moment of our time by driving a petrol car, we were lucky to find that the trip from our house to the airport could be electric too. Normally, we would have to take a taxi, which would be some crazy sloppy limousine’ that bounced all over the place with a suspension so soft that one pothole in our street would see it bouncing all the way to the airport! 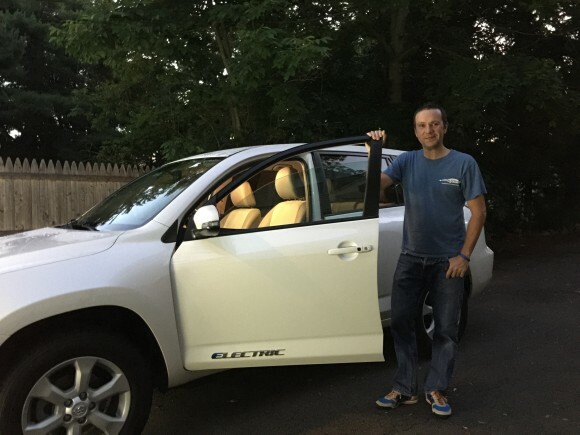 However, we are fortunate to know someone who recently signed up to be an UBER driver with his electric Rav4 EV – our friend Airton. We were able to book him for the trip to the airport, oh my goodness – how nice to drive to the airport in an electric car. Take note Toyota – this is the car we want, not some silly hydrogen powered thing that has no performance and no where to fill up! Hopefully one day there will be an electric aeroplane and that would be just wonderful. But until then… we are stuck with fossil fuels and a donation to offset the carbon. 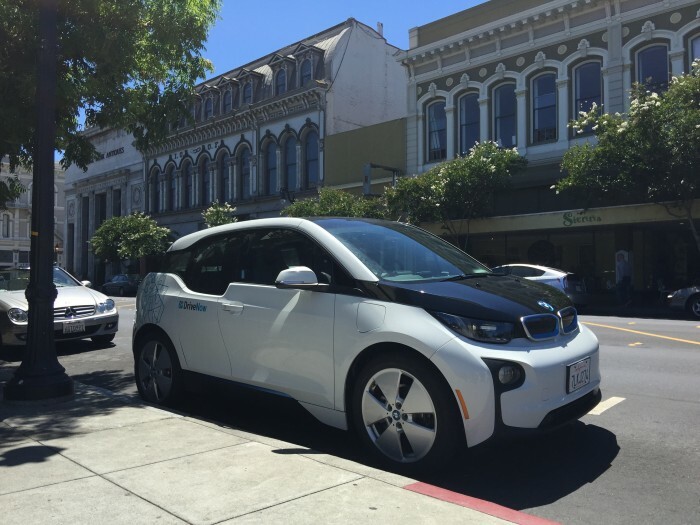 The plan was to fly into San Francisco International Airport and try out the DriveNow Car Sharing Program from BMWi that uses a fleet of BMW i3. To use the service, we had signed up for an account in plenty of time before we left but, just a day or too late to receive our personal DriveNow Access card in the post – the importance of that mistake will become apparent soon but for now, if you use the service, do sign up at least two weeks in advance to make sure you have the card in hand. In the absence of the card, we decided to chance it and use the Smartphone App alone. The app warned us that the service via the app is still in a trial phase but we pressed on! We were told that they always had plenty of cars at their pick-up location at Sky Park just off the airport property so, after we’d got off the aeroplane we pulled up the app to locate a car. First it showed us ones quite a distance from the airport… hmm that’s not right. We called the DriveNow helpline to see if they could help us find a car at the airport. I would say that the customer service at DriveNow is excellent, and the guy on the other end of the phone was really helpful in locating a car at the airport. After relaunching the app, we checked for cars again and we found that there were three cars near to the airport – the app even showed us the battery charge level to help us pick the right one. Feeling nervous that we might trek out to the location and find them all gone, we reserved one called Fuji (I believe that there was a competition launched for people to enter names to call the cars), which was then held for us for 15 minutes, which seems a little ridiculous when you are at the airport and have to get to the pick up location. With the car reserved we just had to find out how we got to the car. We went to the Information Desk located within the airport and asked where we needed to go to pick up a bus for Sky Park. Apparently that was up a level so we headed up the escalator and then outside. Gosh – there are so many signs, where is the one for Sky Park? Finally, heading in the right direction we walked to the sign that had Sky Park on and waited for a bus to show up. One arrived a few seconds later but wasn’t the one we needed, apparently we had to wait for a blue and white bus. Four more buses arrived and left as they weren’t blue and white. While waiting our reservation expired so we reserved again, giving us another 15 minutes. When the correct bus arrived, we got on and headed to the offsite parking area for the DriveNow cars. The bus was extremely bouncy and not good for my delicate insides. Even the aeroplane journey had been a lot better. As we entered the Sky Park parking area, our fifteen minutes expired again, so once again, we reserved the car – see what I mean about 15 minute reservations? It just doesn’t work for the airport cars. Anyway, after getting off the bus, the bus driver brought the car around to us and we found ourselves stood in front of the car. 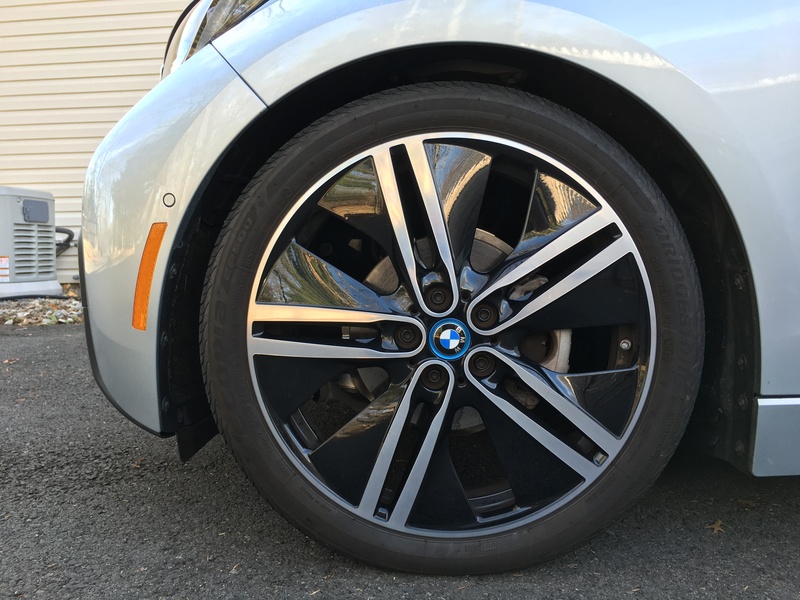 First impressions of the car – well I already have a BMW i3 so it looks just like mine but with a huge difference – it’s white – Noooooooo!!! We tried to unlock the car by using the app as we didn’t have our DriveNow access card. The car wouldn’t unlock, mainly because there was nothing showing on the app anywhere that said unlock the car. Apparently, to stop people hogging cars, you can only reserve them a couple of times. Time for another phone call to DriveNow and with another helpful chappy on the other end, we found ourselves, about 20 minutes later, able to get the car unlocked. Apparently, if we had a DriveNow card then life would have been a whole lot easier, the app, is not perfect yet. Finally, we were in the car, which is good as it was a little chilly in San Francisco and we were dressed for 30℃ weather. 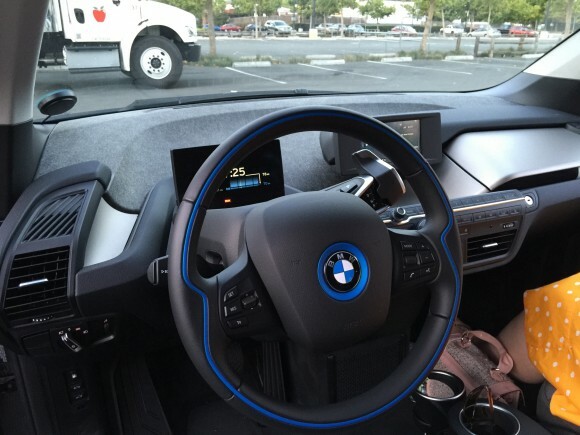 The DriveNow system is fully integrated into the cars on-board infotainment system – this is no aftermarket hack with the ignition key chained to the dash! Unfortunately though, the car was a REx – it had the range extending petrol engine, a huge downside for me, especially over here in California where there are so many public chargers. Probably a sensible choice for most people and, indeed, the petrol gauge was showing 75% so someone had miscalculated a trip! The interior was the European Standard specification which is similar to the US Mega Interior with one big difference; it is dark grey rather than the pale grey that we have. It also had the dark grey steering wheel, and silver aluminium accents where ours is dark plastic. I like this interior – a lot. With our destination plugged into the navigation we set off to the hotel in Cupertino. The car was charged to 98% so we made it down there easily. Our first attempt at a CCS fast charge was interesting. We drove to the local WholeFoods as they have a CCS charger operated by NRG. 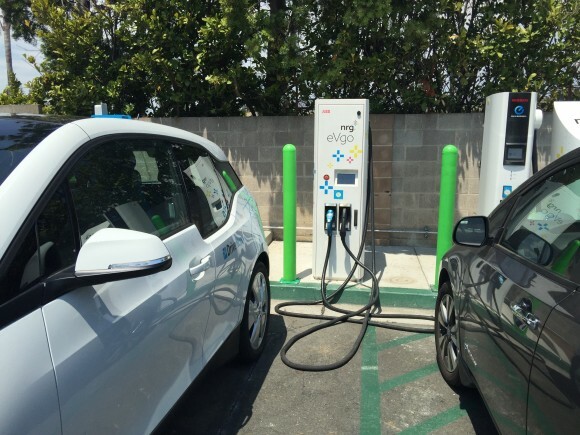 We were in luck and the chargers – Two CHAdeMO, one CCS and a pair of Level 2 – weren’t blocked. We parked up and plugged into the CCS charger and success, the car started charging. We left the car to charge while we went into WholeFoods to get something to eat. The car had reckoned it would take about 10 minutes to get to 80% so as we were walking around we thought we would check the car before getting food as if it had reached 80% then we felt we should move it to a Level 2 to finish off the charging as we didn’t want to be taking up a fast charging space if we were no longer charging at the faster rate. We went back to the car and decided to move it, but unfortunately both of the Level 2 chargers that were there, were both not working! We then thought we would move back to the CCS charger, but a Nissan LEAF had also plugged into the CHAdeMO side of the combo CHAdeMO/CCS which meant that we couldn’t continue to charge until the LEAF had finished…Ugh! So we gave up and decided to return early the next morning. The next morning we returned to WholeFoods and plugged into the CCS charger. It charged to 95.5% then just cut off saying it couldn’t fast charge anymore… in other words game over and please leave. We left with 95.5% charge and went to our next destination with a quick 10 minute stop at another CCS fast charger station along our route. The DriveNow idea is really good. Our biggest downside at the moment is not having a card. 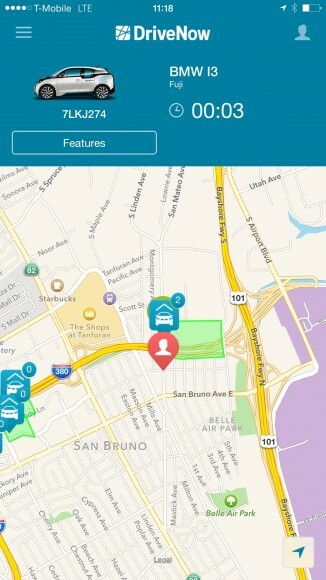 The app to lock and unlock the car is okay and it does work but it is very slow. We feel we waste a few minutes each time we go out waiting for the app to send to the car the message to unlock and the same again to lock. We were really enjoying driving around on electric, so glad that there are so many public chargers around that we could always find a place to charge and avoid the engine coming on – for me, I really dread that happening. The amount of chargers to be found around the bay area is great, especially compared to the East Coast of America and especially where we are in New Jersey. The next hotel we stayed at in Sonoma had two Level 2 chargers free for us to use. This would always ensure we had a full charge each morning. On our way up to Sonoma we decided to stop for a quick charge to prevent the engine from coming on. There was a Prius plugged into the Level 2 and we plugged into the CCS. In the 15 minutes we were stopped there, the Prius owner never returned and a LEAF turned up to use the CHAdeMO charger. Arriving at the hotel in Sonoma we located the Level 2 chargers and plugged in only to be told at reception that we had to wait until 8pm before charging. That is a little frustrating but I guess we shan’t be complaining as it was free for us to use and still meant we had a full charge each morning. 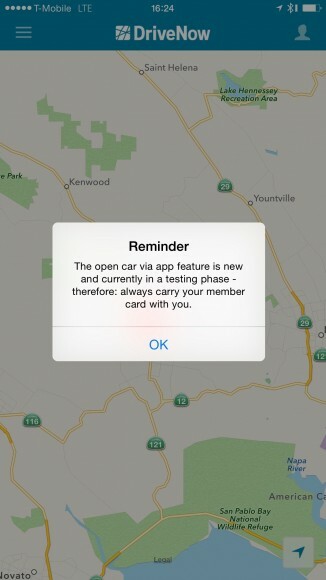 It really was becoming a pain trying to operate the car using the app. The app is not really ready for solitary use and it added time to our day that we didn’t particularly want to waste. However, that was nothing compared to the realisation that cell phone reception in the region might not be perfect – no signal means no locking/unlocking the doors so we thought we’d better do something about it. On the Monday we got a call from Dana at DriveNow who offered to overnight a card to the hotel that we could use with the car and the next day, the card arrived – Yay. We are so excited that we went straight to the car to test it out – But… Nothing, just nothing, it didn’t work. The car stayed locked. 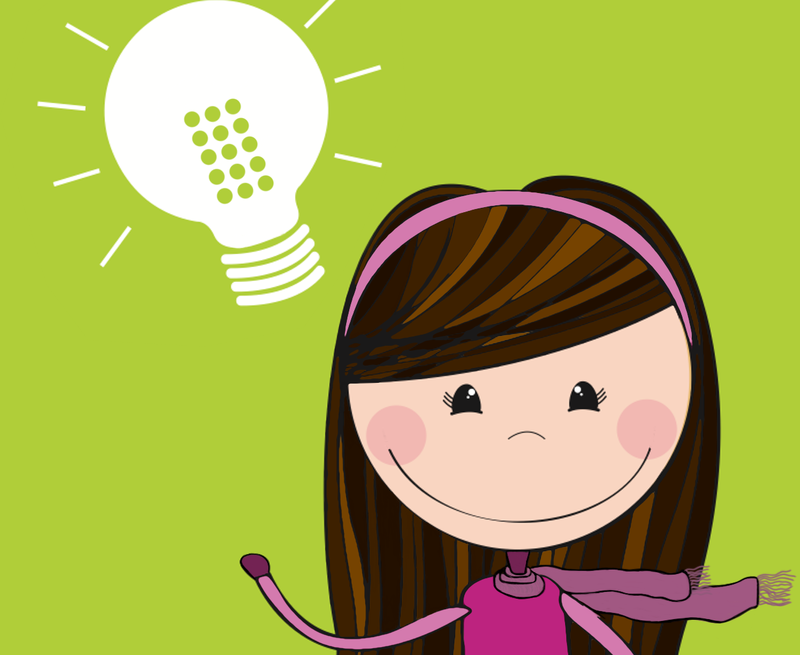 Ugh, ugh and ugh – this is beyond frustrating now! We hadn’t ‘properly’ locked the car the night before and could access the car from the boot so we decided to head out and call DriveNow again to find out what was happening. They didn’t really know why the car wasn’t behaving as it should. My sidekick thought that it was because they cancelled the first card to issue a second card, therefore the car no longer thought we had it. Oh my goodness this is silly. We were wasting too much of our precious holiday time on the phone to DriveNow. We decided that while out and about that we would go to a local attraction – the Old Geyser of California – something we hadn’t seen before. We got out of the car but still nothing from the card or the app. We chose to lock the two doors knowing that we can get in through the boot again. After seeing the Geyser we headed out to the car, only to find that the DriveNow people had locked the car – we couldn’t get in! Oh, and unusually for this area – it was raining!! Ugh, ugh and triple ugh. Back on the phone and Michael in Fleet Services worked with my sidekick to end the rental, so we could re-rent it again with the card and, it worked! The app recognised the car, the car recognised the card – Yay, in fact triple yay!! We can finally be on our way under our own control. When we stopped at our next destination, we just got out of the car, touched the card to the windscreen and guess what? The car just locked… so simple and after four days of frustration, this simple task of locking a car was just so wonderful. After that, the whole experience was great. 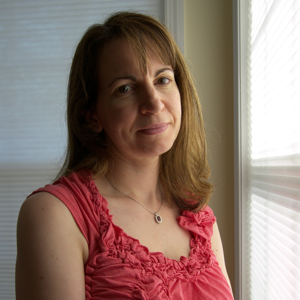 We were able to go out as and when we pleased, knowing that the car would respond to the card. Once we had the card we didn’t use the app again at all – its role in finding and booking was great but control, locking and unlocking was really only enough for the occasional use – actually, what the service was developed for. We spent the rest of our holiday driving around on electric, enjoying the sights and scenery and not worrying about anything. We knew where we could charge if we needed to. We didn’t need to worry about charging while out as there are so many options here in California, there’s even Level 2 charging at the beach which gave us enough time to wander on the beach and down to the sea while getting enough charge to get us back to the hotel without having to stop again. 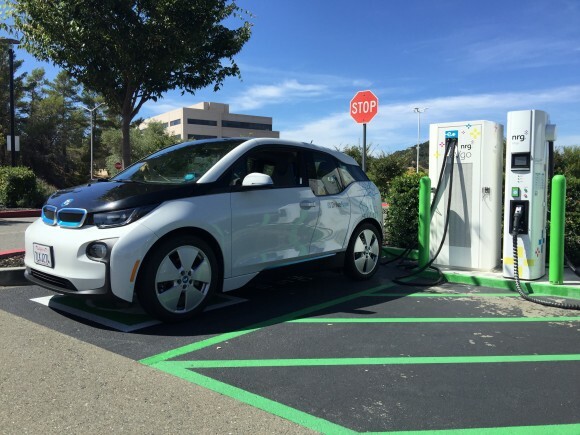 The car itself, the 2015 BMW i3, performed flawlessly and the available CCS fast charging network here from NRG eVgo is brilliant, it makes owning a 80 – 100 mile EV totally doable. We’ve met people early in the morning that stop at the local Wholefoods just to fast charge. They go for a run, read the paper while they wait that 30 minutes for their free fast charge, we wondered if these people didn’t have charging where they lived as they were always there around 6:30 – 7am. 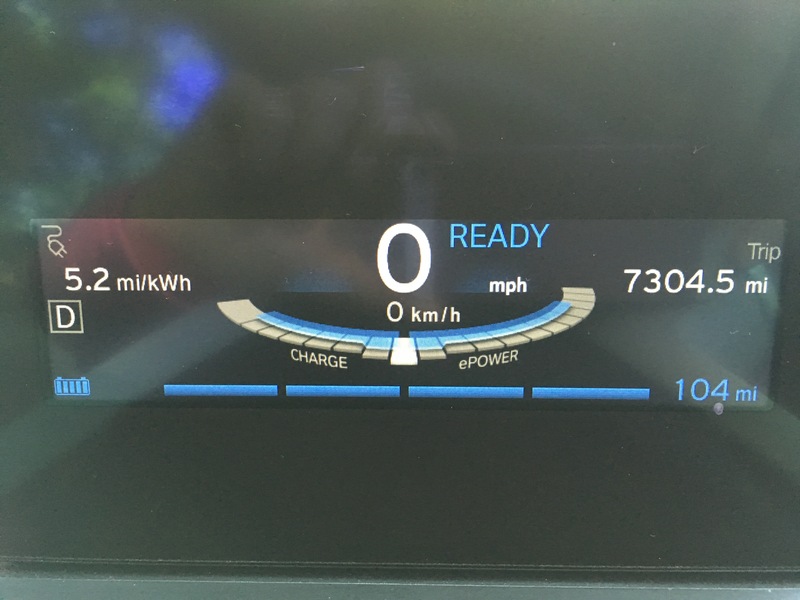 Oh and my mission to never use the engine while here – a total success, we managed hundreds of miles on our whole trip on electric only – thanks to the brilliant network of charging options. The DriveNow program was also a success once we had our card in our hand. The app worked well for finding and reserving the car and would suffice in a pinch if you didn’t have your card with you… Now, if they only had that kind of network on the East Coast – we can only dream! !